Breast cancer relapse, in a large number of patients, after initial response to standard of care therapy warrants development of novel therapies against recurrent and metastatic cancer. Cancer stem cells (CSCs), present in breast tumors while being intrinsically resistant to conventional therapy, have the ability to self renew and cause tumor recurrence. The residual tumors after therapy, with dramatic enrichment of the CSCs, have all the hallmarks of epithelial- mesenchymal transition (EMT). This review will focus on the link between EMT, CSCs and treatment resistance, since a better understanding of these interactions will allow us to effectively target the residual population after therapy. Mortality from breast cancer has steadily been declining over the past decade, primarily due to earlier detection, adjuvant therapies and the advent of targeted therapies for estrogen receptor-positive and HER2-positive cancers [1, 2]. Despite these advances, a large number of patients relapse after an initial response to standard-of-care therapy. Novel therapies that prevent breast cancer relapse and metastasis are needed. An emerging hypothesis is that tumors contain a subpopulation of cells, called cancer stem cells (CSCs), which have the ability to self-renew and regenerate the tumor. Increasingly, clinical evidence points to an intrinsic resistance to endocrine therapy and chemotherapy of this subpopulation of CSCs . The residual tumors after chemotherapy are enriched for CSCs and have a gene signature with hallmarks of epithelial-mesenchymal transition (EMT)-like properties [3, 4]. The present review is a step in developing an understanding of the nature of treatment resistance and the role that EMT and CSCs play in this process. EMT is a process by which the epithelial cells change to a mesenchymal phenotype. This process involves an increase in fibroid morphology, invasiveness, resistance to apoptosis and an increase in extracellular matrix components [5, 6]. The acquisition of EMT in the epithelium of an organ may be one of the initial steps on the path to tumorigenesis . EMT has more recently been linked to the progression of cancer and increased stemness of tumors . This correlation between EMT and CSCs may provide a direct link between the CSCs and the metastatic potential of cancer. An increase in EMT markers has thus been linked with aggressiveness of metastatic disease, which may be explained by increasing stemness of tumor-initiating CSCs and intrinsic resistance to standard therapies. EMT can be induced by signals from the stroma associated with tumors - such as hepatocyte growth factor, platelet-derived growth factor, and transforming growth factor beta - together with a series of EMT-inducing transcription factors such as Snail, Slug, zinc finger E-box binding homeobox 1 (ZEB1), ZEB2, Twist, Goosecoid, and FOXC2 [7, 9, 10]. A negative feedback pathway involving ZEB1, ZEB2 and transforming growth factor beta may be responsible for regulating EMT. The transforming growth factor beta/SMAD1/LEF/platelet-derived growth factor axis is also described as being important for EMT signaling . Along with these transcription factors, the miRNAs play a role in EMT; specifically, downregulation of the miR-200 family causes an induction of EMT. The details of the interaction of all these factors with each other are currently under investigation (Figure 1). 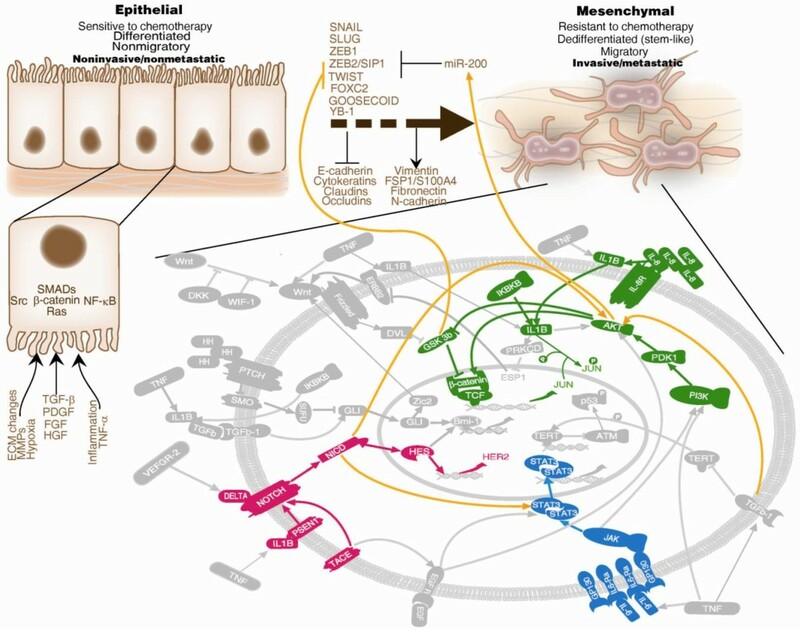 Interaction between epithelial-mesenchymal transition and self-renewal pathways of cancer stem cells. ECM, extracellular matrix; EGF, epidermal growth factor; EGFR, epidermal growth factor receptor; FGF, fibroblast growth factor; HGF, hepatocyte growth factor; MMP, matrix metalloproteinase; PDGF, platelet-derived growth factor; PDK1, phosphoinositide-dependent kinase-1; PI3K, phosphatidylinositol-3-kinase; SMAD, Sma and Mad-related family; TCF, T-cell factor; TGF, transforming growth factor; VEGFR, vascular endothelial growth factor receptor; ZEB, zinc finger E-box binding homeobox. Breast cancer can be classified as a series of diseases based on its different subtypes. Traditionally, immunohistochemistry has been used to describe the different subtypes of cancer. Recent use of microarray analysis, however, has provided a more coherent tool to separate these subtypes into luminal A, luminal B, HER2-positive, basal, normal-like and a new subtype called claudin-low-like, which displays spindeloid features and EMT-like properties . The breast CSCs were initially identified based on a seminal paper from Dr Michael Clarke and Dr Max Wicha's group that identified them as being enriched for CD44+/CD24-/low cells and having the ability to form tumors at a much higher frequency than the bulk tumor . More recently, ALDH1 levels as identified by the ALDefluor assay were also demonstrated to enrich the CSCs [13, 14]. Apart from flow cytometry analysis of stem cell markers, the ability of tumor cells to form mammospheres (spheres of cells formed under ultra-low attachment conditions, in serum-free media supplemented with growth factors) as a surrogate assay of the stemness of the cells has been described [13, 14]. This ability is calculated as a percentage and called the mammosphere-forming efficiency (MFSE). The MFSE as a reflection of stemness is generally confirmed with limiting dilution transplantation assays where the tumors enriched for CSC markers form xenograft outgrowths with 10 to 200 cells - compared with 100,000 or more of the other tumor cells, which fail to form tumors. These supporting data point to a population of cells that is responsible for tumor initiation and self-renewal. However, there is a caveat to this hypothesis. There is currently no evidence that any cell within the tumor cannot become stem-like on exposure to various treatments, thus alluding to the possibility of plasticity of cells, allowing for transition from one cell type to another. CSCs may have an intrinsic resistance to therapy . Current treatment strategies may therefore affect the bulk of the tumor cells but leave CSCs behind, serving as a starting point for disease recurrence. Similar to the ability of the dandelion roots to regenerate weeds, tumor regrowth from an intrinsically therapy-resistant subpopulation has been termed the dandelion hypothesis . If this hypothesis is true, then understanding the mechanisms responsible for this intrinsic resistance will lead to development of new therapies that will target the CSCs in conjunction with current standard-of-care therapies that could critically impact the overall patient survival. Clinically, the evidence for breast CSCs is supported by a study in which paired tumor core biopsies taken from patients with breast cancer prior to and during the 12-week treatment with chemotherapy demonstrated an increase in CSC markers (CD44+/CD24-/low and MFSE) with treatment . Conversely, patients with HER2-positive disease who received neoadjuvant lapatinib (epidermal growth factor receptor/HER2 inhibitor) for 6 weeks demonstrated a reduction in the percentage of CSCs as evidenced by a decrease in the MFSE and CD44+/CD24-/low levels in residual tumors . This suggests that the CSCs may be resistant to chemotherapy but may be targeted by therapy directed against the HER2 proto-oncogene. Further investigation into these tumor biopsies to identify the processes involved in CSCs led to the identi-fication of a gene signature for breast CSCs . Briefly, RNA was isolated from these CD44+/CD24-/low-positive cells as well as mammospheres formed from these patient samples, and microarray analysis was performed. This involved comparing the gene expression of CD44+/CD24-/low versus bulk tumor and of mammosphere-forming cells versus bulk tumor . Genes that increased or decreased in both datasets of CSC markers were combined to give us a gene signature for CSCs, which matched the claudin-low-like phenotype. Claudin-low-like tumors were recently identified and represent only about 5% of all breast tumors. One of the most important properties of these tumors is that they display EMT-like characteristics, and have high expression of vimentin and Twist. In addition to claudin-low-like tumors, another rare subtype of breast cancer (metaplastic tumors) was recently found to share molecular similarities with CSCs. These metaplastic tumors are highly chemoresistant and aggressive tumors, characterized by squamous metaplasia of malignant breast epithelium . Hennessey and colleagues demonstrated recently that a set of 28 metaplastic tumors had CSC-like characteristics based on transcriptional profiling using our published CSC signature . These tumors also showed EMT-like characteristics, along with increased mutations and amplification/activation of the phosphatidylinositol-3-kinase/AKT pathway. More recently, it has been shown that both metaplastic and the claudin-low-like tumor interactome have EMT-like properties . These results from claudin-low-like and metaplastic tumors suggest a hierarchical nature of breast cancer where tumors arise from changes occurring early in a hierarchy, rather than late, which are observed in the more differentiated tumors. EMT proceeds in a series of steps, where cells eventually acquire a more spindle-shaped morphology. This involves gradual loss of cell-cell adhesions, tight junctions that facilitate cell-cell interactions, which eventually leads to the reorganization of the cytoskeleton, with loss of apical polarity, and finally the epithelium conversion to spindeloid morphology [16, 19–23]. In EMT, the cancer cells acquire the ability to invade into the surrounding microenvironment and thus may lead to relapse and metastases. Using an in vitro method, Mani and colleagues reported the induction of EMT in immortalized human mammary epithelial cells (HMLERs), by ectopic expression of either the Twist or Snail transcription factors. The overexpression of Twist or Snail made the HMLERs more mesenchymal in nature, with an increased ability to form mammospheres and an increased expression of CD44+/CD24-/low CSC markers . These data support a direct link between EMT and loss of epithelial properties and gain of CSC-like properties. Further work by the same group has shown that FOXC2 may play a key role in the induction of EMT in vitro and this is corroborated by the tumorigenic signature from our group, thus suggesting that FOXC2 may play a role in development of EMT and in CSCs self-renewal . EMT was rarely found in bulk primary tumors as shown by loss of heterozygosity studies, which compare the epithelial and stromal compartments of breast cancers . EMT has been described to play a role in the invasion-metastases cascade in some invasive cancers, however, suggesting that EMT may be working in the CSC milieu. In both normal cells and breast CSCs a low expression of the miR-200 family of miRNAs has been shown to increase EMT , probably via their known negative regulation of Zeb1 and Zeb2. Both normal cells and breast CSCs have also been shown to express low levels of the miR-200 family of miRNAs, which are known to negatively regulate transcription factors Zeb1 and Zeb2 and to promote EMT. METs is an important component of tumor metastasis since once the tumor moves from its primary site to a secondary site it has to undergo mesenchymal-epithelial transformation (MET) in order to generate a tumor similar to the one at the primary site of breast cancer. EMT endows metastatic properties upon cancer cells to promote invasion, migration, and subsequent dissemination . Following dissemination, establishment of metastatic lesions depends on the organ-colonizing properties of disseminated tumor cells as well as on permissive conditions also referred to as the metastatic niche that may be present in the restrictive microenvironment of target organs [28, 29]. For instance, recruited bone-marrow-derived vascular endothelial growth factor receptor-1-positive cells were able to generate a pre-metastatic niche in the lungs to support initiation of metastases in one study , while another study demonstrated the role of bone-marrow-derived c-kit-positive VE-cadherin-positive endothelial progenitor cells in angiogenesis-mediated progression of micro-metastases to macrometastases . The observation that the cancer cells in metastatic lesions exhibit an epithelial phenotype that resembles the primary tumor from which they were derived has led to speculation that the disseminated tumor cells recruited into the target organs may undergo MET that would favor metastasis formation [32, 33]. The MET cascade has not been recapitulated in tumor progression, however, and the cellular and molecular regulators that promote MET of metastatic tumor cells remain unknown. Notably, MET is an essential developmental process and has been extensively studied in kidney organogenesis and somitogenesis . Importantly, during kidney development, the conversion of metanephric mesenchyme to epithelium  involves MET that is regulated by versican. Indeed, ectopic expression of versican in NIH3T3 fibroblasts in culture resulted in an epithelial phenotype . Given that versican expression is confined to the stroma [37–42], there is a possibility that the disseminated cancer cells may undergo MET under the influence of local microenvironments that they encounter in the parenchyma of the distant organ. Another possibility is that this microenvironment may also lack the heterotypic signals that promote EMT . CSCs display EMT characteristics, which are a critical component of treatment resistance in breast tumors. Our studies on the tumorigenic signature have identified increases in VIM and MMP-2 along with FOXC2 in letrozole/chemotherapy-treated specimens, and immuno-histochemistry studies have indicated an increase in epithelial cells undergoing EMT in post-treatment biopsies. These observations have been discussed in greater detail elsewhere . Other studies have shown that the onset of EMT leads to an increase in the subpopulation of CSCs as described by an increase in various markers involved in the pathway. Overall, the literature supports EMT playing a major role in sustaining the CSCs, which leads to an increase in the metastatic potential of breast cancer. A better understanding of the role of EMT and CSCs in breast cancer will lead to more effective therapies that will target not only the bulk tumor but also the residual population of cells that are responsible for the relapse and resurgence of the tumor. It is imperative to study EMT and CSCs together in order to have a better understanding of treatment resistance in breast cancer. Further examination of the epigenetic changes such as miRNA will also be an important area of research. This article is part of a review series on EMT and the connection with stem cells, edited by Dr Jenny Chang. zinc finger E-box binding homeobox. The authors would like to thank Dr Stephen T Wong for his illustrations and his input.